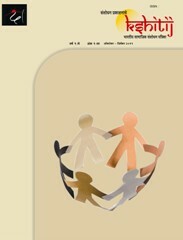 KSHITIJ- A dedicated marathi research Journal at national level coved Arts, Literature, History, Social Science, Political Science, Commerce, Home Science and Home Economics and performing arts, music etc The current editorial committee of the journal includes members of research center heads, faculty deans, department heads, professors, research scientists, experienced and directors from all over country. Printed copies of the journal are distributed to accredited universities and government libraries. All the papers in the journal is also available with online full-text content and permanent worldwide web link. The abstracts will be indexed and available at major academic databases.